Griffin StompBox: saves you having to stamp on your iPhone's delicate screen. Using your iOS device on-stage as a guitar effects processor may be about to get a little more feasible thanks to the launch of Griffin Technology's StompBox. 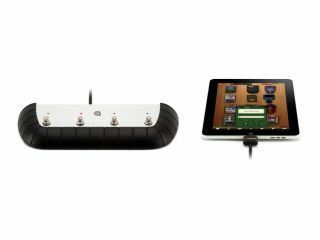 This is a dedicated pedalboard for the iPhone, iPad and iPod touch that's been developed in conjunction with Frontier Design Group. What isn't yet clear is whether or not the StompBox will be usable with other iOS guitar software such as IK Multimedia's AmpliTube. We do know, however, that it'll work with the iPad, iPhone 4/3G/3GS and iPod touch 4th generation. Its availability is listed as 'coming soon' and the price has been set at $100.